MONROVIA, Liberia -- Liberia's president on Monday urged her countrymen to double their efforts to reach the government's goal of having zero new Ebola cases by Dec. 25, a target some experts have described as highly ambitious. "We've set a pretty tough target. But when you set a target it means that you stay focused on that target and on that goal and then you double your efforts," Sirleaf said during a ceremony marking the docking of a Dutch aid ship in the capital, Monrovia. "When you're running a race, as you get closer and closer to the finish line you pick up the speed because you want to make sure that that last mile you will give it your best bet," Sirleaf added. Liberia has recorded nearly 3,000 confirmed, probable and suspected Ebola deaths since the outbreak began -- far more than any other country, according to the latest World Health Organization figures. 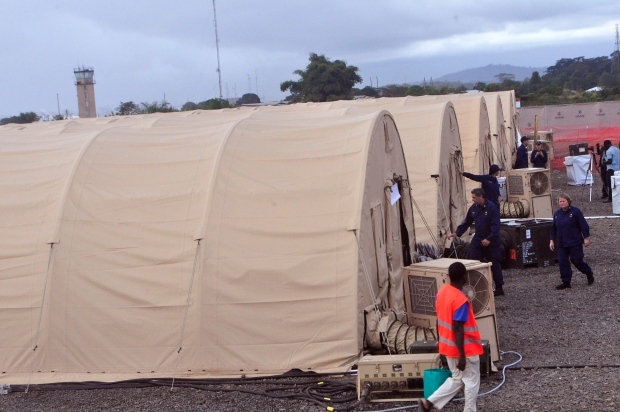 The number of new cases in Liberia has declined recently, however, prompting the U.S. to scale back the size and number of treatment facilities it is building. Still, officials have warned against complacency. Anthony Banbury, who heads the U.N. fight against Ebola in West Africa, said Friday that while achieving a decline in cases is difficult, reaching the point of zero cases in the region will be "much, much harder." The arrival of the Dutch naval vessel, the Karel Doorman, in Monrovia marked the end of its tour of the three countries hardest hit by the Ebola epidemic. The ship visited the capitals of Sierra Leone and Guinea in the past two weeks, said Julius Kanubah from the European Union's political section in Liberia. Nine European countries and the United Nations Children's Fund donated 160 vehicles, 80 containers and 1,200 tons of supplies for humanitarian agencies. Sirleaf thanked the E.U. for also providing aid to Guinea and Sierra Leone. "We are never totally free from Ebola until all of the affected countries... are also free from Ebola," she said.